The Purpose of this course is to provide an initiatic experience whereby the aspirant participant will be able to gain the knowledge and experience of what is to be learned at the Temple of Asar (Osiris) in Abdu Ancient Egypt by reading, studying and practicing the teaching presented in the panels by following a special sequence of movements through the temple and focusing on certain stopover or weigh station areas that have been discovered to contain a connected initiatic teaching leading from novice status to full realization as an enlightened “Royal Personality”. Those who complete the course may consider themselves as having completed the academic requirements to consider themselves as initiates of the Temple of Asar and in their personal lives as they progress with the inner teaching they may consider themselves as followers and initiates of the teaching of the Asarian Resurrection Egyptian Mysteries. Instruction: place your mouse over the image and left click to move the image around in all directions and click on images and notices you might see. with the Trilinear Decipherment Method. You will also begin working working with two books that will be provided below as ebooks. The first is the AFRICAN RELIGION Vol. 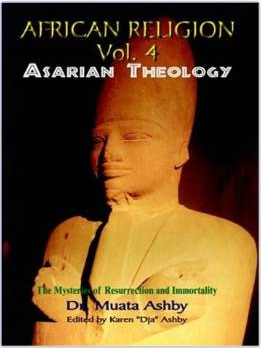 4 ASARIAN THEOLOGY so that you may familiarize yourself with the Asarian myth upon which the mystic teaching of the temple os build upon. The myth of the Asarian Resurrection is integral to the teaching presented in the temple. As such you as an aspirant are the Asar being discussed in the myth and in the temple. Therefore you are to study this teaching by referencing the book and the video presentation while you spend time in this section of the temple. 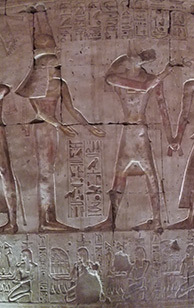 This course makes use of direct readings and studies of the panels of the temple so it will be even more helpful if you have at least a basic introduction to Ancient Egyptian Hieroglyphs (Medtu Neter). So you will have the opportunity to work through the book as you progress in the program beginning with lesson 1 and by the time you encounter the first main panel you will have some introduction that will actually help you assimilate more of the teaching and gain more benefits as you move forward through the program. 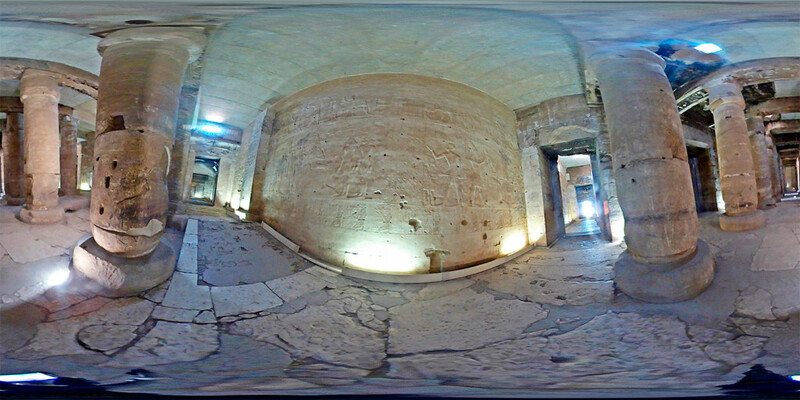 This is an advance announcement of the proposed creation of a 360 degree virtual reality online Temple of Asar in Abydos Egypt, from Virtual Reality photos taken on site during our last visit. This project proposes to create a composite virtual world an aspirant can go into and feel as if being there (or at least the next best thing). Inside there will be clickable areas with closeups and lecture recordings that were given with the idea of conveying an experience as close to the original as possible. It will be possible to “walk” through the building as if on a tour, and be directed to discover the teaching of the temple and the program laid out in the temple architecture, scriptures and iconography as rediscovered and taught by the servant Muata Ashby, for aspirants to follow that leads to enlightenment. The project is to be created in 5 stages with 34 weekly lessons or temple sections and we hope to complete the first before the end summer of this year (2017). Along with this project a new book volume is also planned that will chronicle and catalog the mystic journey through the Temple of Asar and detail the teaching of the path laid out in the temple, by its creators, for aspirants in ancient times and also available for aspirants today; for all aspirants seeking spiritual enlightenment today as was followed in Ancient times. What is being proposed in this project? What makes it unique and important and unprecedented? What features might be possible with such a project, using the advent of modern technology at present? What if you could also trace that path and retrace it at will or spend as much time as you would want in that sacred space? What if you could see detailed images of specific texts on relief panels on temple walls for detailed study, as is done on many web sites and in many books? What if along with the image you were to get not only a general description of the panel and what is supposedly happening, and its supposed spiritual significance, as regular tour-guides do, but also get a translation as well, so you can see and hear the teaching from its source and then receive an interpretation based on philosophical insight from that instead of assumptions and or suppositions surmised by scholars who do not know the sebait or Ancient Egyptian philosophy, but fill in gaps in their knowledge based on western or modern cultural values and histories? 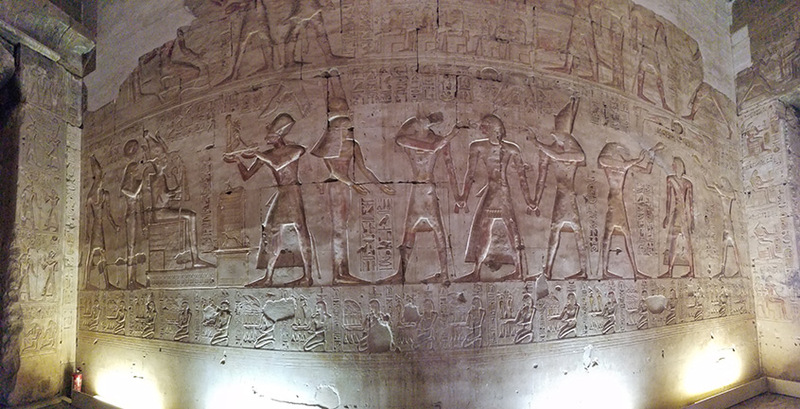 What if you could see, not just section photos as usually appear in books on Ancient Egyptian temples, but special panorama images that show entire scenes instead of only sections that are not as easily connected to the whole panel and its teaching? What if you could take that a step further and also see special 360 spherical images so you could look at the ceiling, the floor, behind and to the sides and connect the panels being discussed to the room as a whole and thus also having available a spacial relationship to the whole building? What if you could see the panels and the rooms they are in as if you were looking at a real estate tour, step back, move in closer, and go to all the rooms of the temple and have a spacial reference of where the rooms are located in reference to each other? What if you could take it a step further and be able to put on Virtual Reality goggles and see the sacred spaces almost as if you were there? What if you could study a book and also go to the world it is referring to but doing that in virtual reality form? What if there could be virtual class meetings and worship sessions and lectures from within this virtual environment? What if you could partake in the lectures and special images that were pointed out as seen by those who made the journey? What if you haven’t gone to Kemet and may never be able to go but were able to access this project? and gain the essence of this special teaching that only a few members of humanity have access to? What if you have never gone but can access this project and later be able to go and see these things in person? to be able to study first and then go? What would your spiritual practice be like with this project as a tool for advancing the spiritual practice? The project is to benefit those who went, those who will go in the future, as well as those who have not gone yet or will never be able to go. Its goal is to provide a quality experience as has never been done before and as only a teaching as brought forth by Muata Ashby could be done as the insights brought forth are based on the hieroglyphic scripture itself and initiatic wisdom rediscovered and now called Maat (Ethics Philosophy), Shetaut Neter (Ancient Egyptian Mysteries), Sema Tawi (Egyptian Yoga), Arat Sekhem (Serpent Power). Is the creation of such a project ambitious? That depends on the time available and resources to put all of the elements together and meet the costs required but in principle, No because it is within our capacities as we access higher aspects of our being. Is the participation in such a project to access this teaching in such a special way within your capacity? If you can hop on a plane and make the journey, certainly. If you can click on a web site, definitely. But we are not just talking about going there to see the sites (which is magnanimous in and of itself but not enough, especially in our times) but also to receive a teaching. ***Can you benefit from such a project or a physical plane trip to Kemet? Now that depends on your individual capacity and maturity and is for you to determine. What you do to make yourself a qualified aspirant to access the teaching, that is up to you. The temple was and is and always will be available in psychic form, in the astral plane, but what about those who need entry to the teaching through a physical access? With this project the temple and its teaching would not be just in Abdu, Egypt, waiting for visitors, and lectures would not only occur there on site, but would extend beyond those borders and enter a virtual realm that encompasses as far as the reach of electronic communications; so to the moon, the stars and beyond? So with this project the temple and its teaching would be moving towards you and you would need to be open to move towards it to access its teachings as expressed by its servants (priests and priestesses). ‡‡‡If you can visualize the benefit of this project stay tuned do the new developments. Pass this press release to those who may benefit and those who can help spread the word to others. 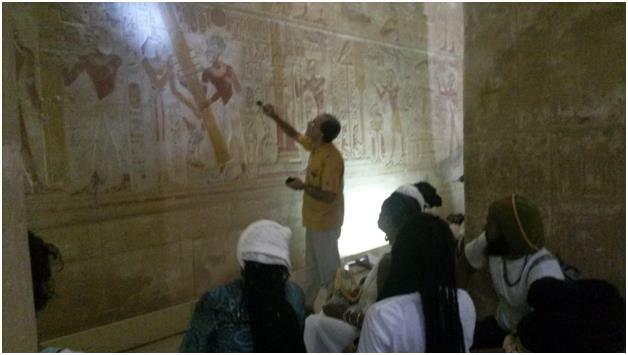 This course should be thought of not just as a university program with lessons but as a facilitation to have an experience that otherwise can only be had by traveling to Egypt to visit the physical temple. More than that the purpose of this course is to facilitate a spiritual experience of evolution towards higher spiritual consciousness by making the teaching presented in the text book as well as in the iconography and hieroglyphic scriptures of the temple come alive in a way that can allow the participant to “plug in” to the wisdom and energy and consciousness of the temple that remains alive with the teaching given by our spiritual ancestors who created it. So the purpose is to access that stream of wisdom energy that can transform the personality even today and render an average person with authentic spiritual aspiration to move towards higher consciousness, the true purpose of human existence. The main theme is not about passing on information though volumes of wisdom teaching will be presented. Importantly also is spending time with the teaching in reflection and meditation; these will be facilitated through the course program. The temple is a living artefact that can connect us to the teaching and to the energies of the Neteru (Cosmic forces) of higher consciousness. In order to make a healthy and beneficial connection it is necessary to process wisdom understanding and at the same time process and resolve worldly aryu (thoughts, feelings, perspectives that drive personality based on past experiences in this and previous lifetimes). This was accumulated over millennia of previous lifetimes so it takes time to work through them in order to be sufficiently clear to receive and make use of the teaching that will be provided in the initiatic sequence of the temple. Therefore, the ideal is not rushing, walking through from beginning to end but rather spending quality time in each section of the temple and listening, reflecting, meditating on the teaching presented to be able to work out the obstructions in the unconscious mind so as to gain insight into the high mysteries of life that all requires purity of heart. Thus also this is an experiential process of inner work instead of only as a viewer, listener receiving a presentation. To facilitate this experience a special web site page has been created whereby the participant aspirant will be able to look at 2D and also 360 degree spherical images and even move into those spaces virtually in order to approximate in the closest possible way without actually going there, the ambiance of being in the temple, which is part of the initiatic experience beyond the books, scripture and iconographical aspects of the teaching. With the new teaching technology it is also possible to get a sense of the architectural space in which the teaching was housed and in effect go inside the divine wisdom teaching computer of the Temple of Asar Ancient Egyptian Mystery and thus augment and accelerate the experiences necessary to attain the goal of the teaching: Nehast or spiritual enlightenment. The Initiatic path lessons of this course are referred to as: initiatic path sequence, or initiatic path progression, initiatic path sequence progression, stopover, or weigh stations. 2-reflect on that teaching while being in the precinct of the teaching (spending time in the virtual temple). 3-Journaling about your reflections (you can do private journalism and also share what is not private in the lesson discussion forum where you can view what others, working through the same lesson, are willing to share. 4-Practice the meditation presented in each lesson- to be practiced every day until the requirements of the lesson are completed and 1 week has past. Quiz/Progress test -questions–taken from lecture vids, visuals of temple, panels in 360 rooms, highlight pictures of the special teachings of each station and or from slides designed to help the study process along and experiential aspect along.